Party nibbles need to be bite-sized, no-spill, and tasty. 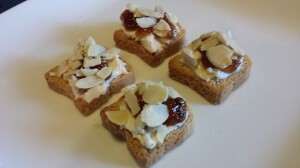 My Fig Almond Cheese Nibbles won’t fall apart in your guests’ hands. A super simple appetizer or party nibble that your guests will love. You might even sneak a nibble yourself — just to be sure they’re appropriately yummy for your guests. Start with some Mini Toasts , or your favorite neutral cracker. Spread some Laughing Cow cheese on the mini-toast. I use the Swiss flavor of Laughing Cow cheese. 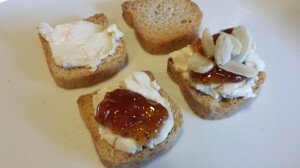 Then top with a dollop of fig jam. 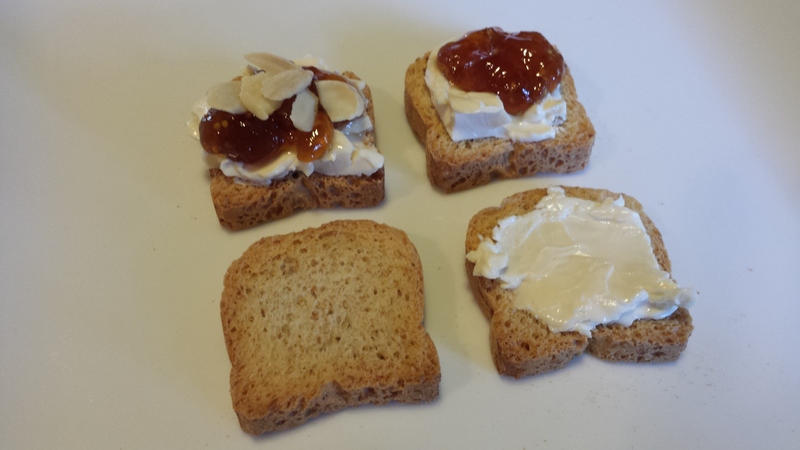 I like to use the Dalmatia Fig Spread . Also, Bonne Maman makes a nice Fig Jam . 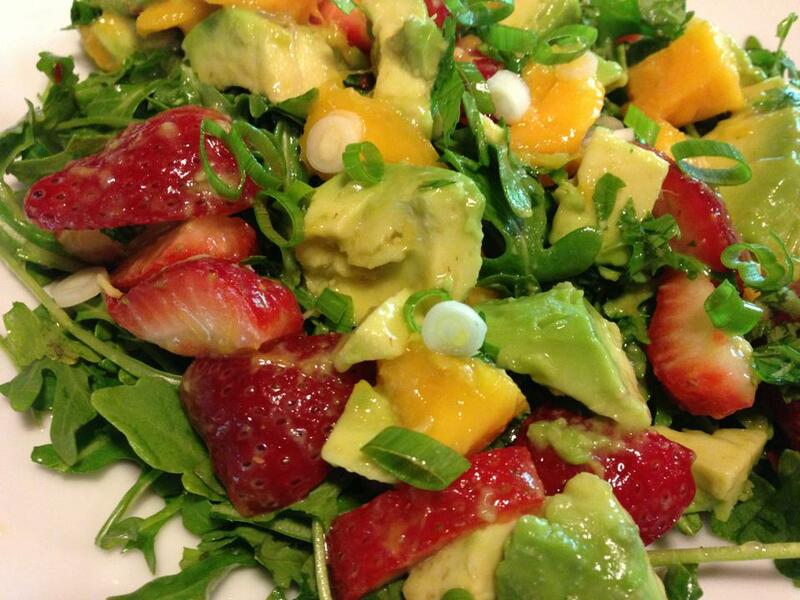 Sprinkle a few toasted sliced almonds on top. 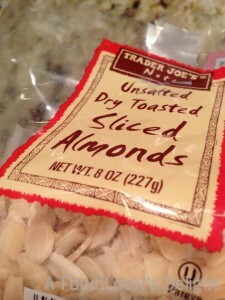 Trader Joe’s carries unsalted dry toasted sliced almonds. You could use chopped almonds or slivered almonds if you can’t find the dry toasted sliced almonds. Spread a small amount of cheese on a mini-toast or cracker. 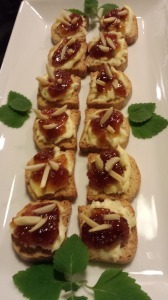 Top with a small dollop of fig jam. 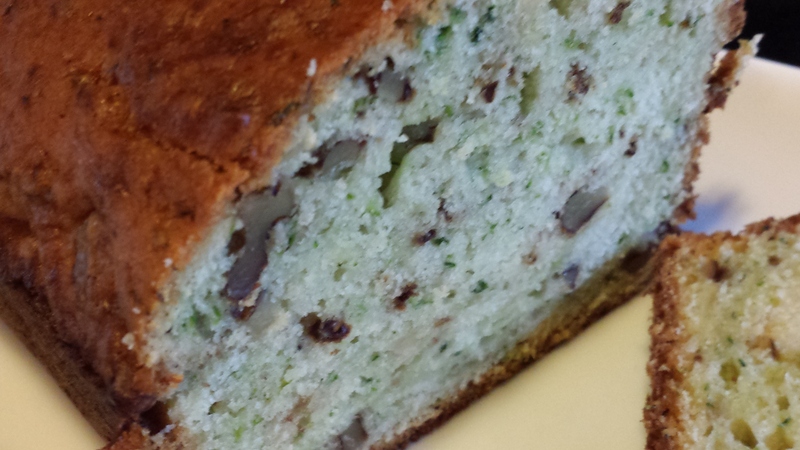 Garnish with a few toasted slivered almonds. Repeat until your mini-toasts or crackers are gone. Serve! Makes 40 nibbles. Double or triple this recipe as needed. 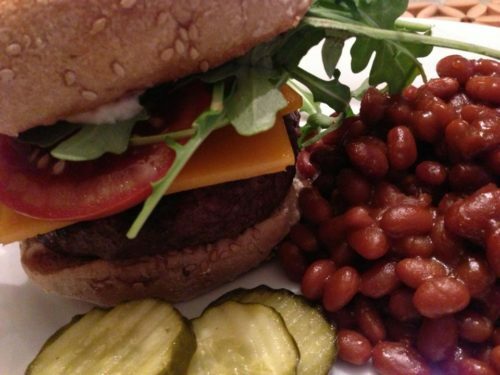 Variations: Use a different flavor of Laughing Cow cheese. 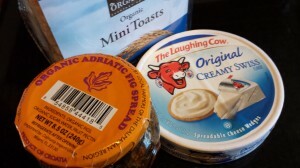 Try spreadable goat cheese instead of the Laughing Cow. Substitute pieces of dried fig for the fig jam, although I like the “stickiness” of the jam which holds the almonds in place. Try a cherry or strawberry jam instead of the fig jam. Use halved or chopped pecans instead of the almonds.